Heres my latest creation. You can click on the pictures to make them bigger. 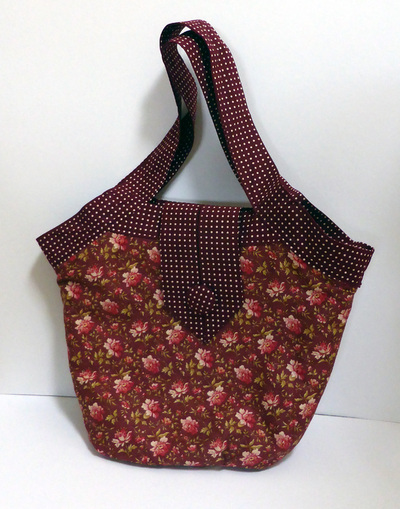 I'm slowly building up some stock now, seven bags made, two sold, so five in stock. Not because they are difficult to make, because I am slow to make them! All my bags are for sale. After several months of procrastination and one sewing machine that had to be returned due to a fault, I have finally settled on my new sewing machine. I am delighted with it, well worth the wait. Thank you Ma for giving me yours several years ago, a fifty year old Frister and Rossman, and thank you Pa for fixing it endless times, but mmm...this one is better!! 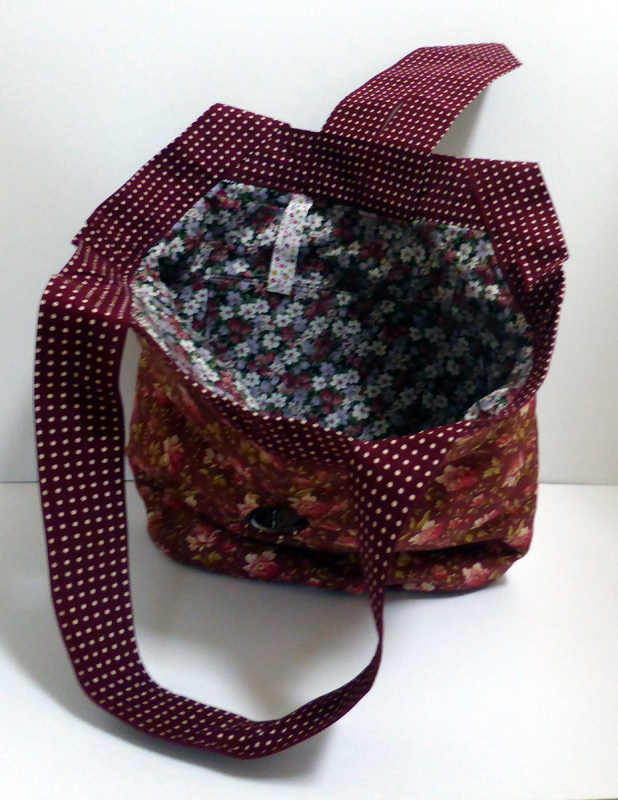 At last I can get sewing again. On Saturday, having easily followed the manual and started using the new sewing machine, I produced this new bag, using a delightful peacock feather patterned material, with a lovely turquoise lining and a 'tie dye' effect material for the handles and edging. I am rather pleased with it. Hope you like it too. This painting was orignally a 'watercolour challenge' from my very dear friend Peter Clements several years ago now and given to a few of us to attempt. I think I was the only one to fully complete it, frame it and put it into an exhibition! It is a challenging painting and a few weeks ago I decided to take on the challenge again, this time in acrylics, a much more forgiving medium than my favourite watercolours. With acrylics if you make a mistake, you can just paint over it! 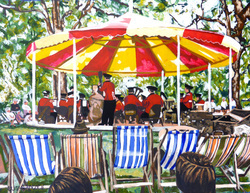 I've also published it under my acrylics page on my website and you can enlarge the painting there. Life has been so busy for several months now that I haven't had the opportunity to be creative or to update my blog. 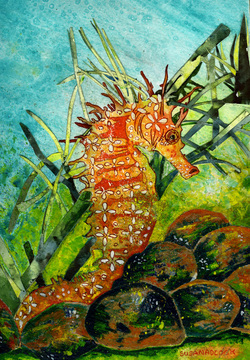 In recent weeks, I've been easing myself back into work, starting by working on an old painting I did of a seahorse and developing it. The original painting was a watercolour/collage but I wasn't happy with the bottom of the painting. I used acrylics to paint over this and to create some rocks. Its still not my most favourite painting but a vast improvement and it gave me the opportunity to get back into painting. Of course, now I have all kinds of ideas roaring at me, but as always not enough time to get the ideas onto paper! I've published my latest pencil drawing on my drawings page. She is called' Brenda Smoking'. I'm quite pleased with how she looks. I love to draw individuals with plenty of character and I often wonder what stories they have to tell while I am drawing them! My garden is starting to look positively autumnal today on the official first day of autumn. This is in spite of the unseasonably warm day we experienced today. Plants are starting to 'go over' although I do have a second flush of unbelievably pretty peach climbing roses. Autumn signifies for me the start of the painting season, a chance to spend more time in my studio now the nights are drawing in and there is less opportunity of the garden beckoning me. Recently I contacted an old friend of mine who I lost touch with about fifteen years ago. I took a chance and wrote a letter to the address I had been carrying around in my head for all these years and luckily she still lives there and replied by email. This person was extremely kind to me when I started what was, at the time, a new work career and I have never forgotten that so I am very delighted to be back in touch with her again, it will keep my heart warm over the winter months. She, like me is very creative and we have been sharing stories of the art we have created, she has found clay, I have found painting! Having said that, at the moment I am working on another pencil drawing, which is immensely enjoyable for me and I will publish it on this site soon. Something rather unexpected happened to me on our recent trip to Portugal. We had invited our friend Fernanndo and his family over for a BBQ. He was our estate agent but now he is a firm friend. I was showing him the schist house paintings that I had taken over with me to frame and hang on the wall in one of our bedrooms and he liked them so much he bought them to hang in his office! So, now these two paintings are on public display in central portgual which is fantastic and I still have a space on my bedroom wall! Thank you Fernando for liking them enough to buy them! I've been painting schist houses in readiness for an up annd coming visit to Portugal -also included under my watercolours page. As already mentioned, I've been using some ideas and practising new techniques as a starting point. Mellis Arts have just had their very first Open Studios and luckily the weather was with us all and a fair few people visited over the weekend. Its always a pleasure and a joy when people express a personal interest in my style and techniques and I thoroughly enjoyed meeting lots of people and talking to them about how I create my paintings. If it helps just one person to express themselves through art then it gives me a tremendous feeling of wellbeing because it may just have started someone off on a new venture. I sold my pencil drawing of Malcolm and several people were particularly interested in my fuschia watercolour painting, which is also a particular favourite of mine. I've started a new painting which I am hoping will adorn one of the walls in our portuguese house eventually. Because I am trying to new subject - buildings, I am trying out some new techniques inspired by other artists. If anyone has read my previous blogs you will what a great fan I am of Ann Blockley's watercolour work. I've just had a look on her website and read her blog and my oh my, what delightful paintings she has recently posted. Beautiful, creative and full of different techniques. I have tried some of her techniques, but I could never produce anything so wonderful as her paintings, she is fantastic. If you ever want to share the secrets of your sucess Ann, I'm first in the queue!!! I've been dabbling in acrylics lately, and do have another painting ready to post on this blog, once the lovely Roy has scanned it for me. The subject matter is what I would call mmm...interesting really - its not a pretty painting at all, but great fun to do; it is so joyful to try experimenting with different mediums. However, for me watercolours will always be my first love.